Spa tourism in Hungary - Real estate in Hungary. Budget accommodation in the center of Budapest! Quality at a reasonable price! Hungary is rich in mineral and thermal waters. Relax in Hungary means to strengthen your health. Would you like to drink mineral water and bathe in thermal springs? Then the rest in the European country of Hungary for you! To say that Hungary - Water Country. Perhaps there is no light on the state in whose territory stretches over much of healing waters, as in Hungary. 1. over 1300 thermal springs. 2.more than 80 officially recognized sources of mineral waters. 3. more than 300 springs of healing waters. Almost every time when they began to drill a well in Hungary, thermal water whose temperature is above 30 degrees wa struggled to the surface. Also found water, was richly saturated with mineral salts. 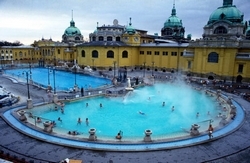 Hungary is among the five richest countries of thermal waters in the world. Maximum capacity, rehabilitation opportunities, long-term knowledge and experience of physicians, as well as the traditional hospitality of the Hungarians can generate a rich variety of proposals in the field of medical and health tourism. Numerous resorts invite tourists to Hungary for treatment. The amount of therapeutic baths only in the capital of Hungary - Budapest is over 40. Huge reserves of thermal waters allow you to visit spa and wellness centers/. However, not only bathing and mineral water - something to be treated in Hungary. Enormous role play the Hungarian bioproducts, useful herbal, local natural winemaking. A spa-centers of the country offer treatment for all types of procedures.